Ryder Windham is the author of over 60 Star Wars books, including my favorites The Complete Vader and The Rise and Fall of Darth Vader. He has also authored Indiana Jones books as well as been the editor for The Young Indiana Jones Chronicles comics. He is my favorite author and not just because he has such a cool name. If you’ve ever read any of Ryder Windham’s books you are already aware of the exhaustive research that goes into each one of them. How else would we have his many Star Wars reference books such as The Death Star Owner’s Technical Manual? He probably knows the Death Star better than Emperor Palpatine himself. Fortunately, we have both survived the humor and humiliation. Neither one of us have known many other Ryders. 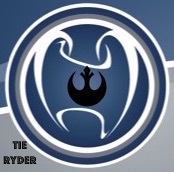 Consequently, Ryder Windham and I have now formed the Fraternal Order of Ryders. Due to ridiculously difficult membership rites and so few people named Ryder, we are currently the only two members and have yet to have an official club meeting, but it’s still one of the coolest clubs I’ve ever been a member of. Our similarities run deep. Mr. Windham has authored countless books, while I have co-authored one. Professionally I am a dentist, and Mr. Windham pulled a young fan’s tooth at San Diego Comic Con (click here for proof). We both are members of The Rogues (www.starwarsintheclassroom.com). And we both love Star Wars and Indiana Jones. Ok so maybe our similarities don’t run deep, but did you notice that we have the same first name?! Recently I had the great pleasure of asking Mr. Windham some questions about his career writing about Star Wars, some of his favorite things related to Star Wars, and about his passion for blood drives and donation. What was your first experience with Star Wars and Indiana Jones? Ryder Windham: From 1992 to 1995, I was an editor at Dark Horse Comics. One of my first assignments was editing comic book adaptations of the TV series The Young Indiana Jones Chronicles. Subsequently, my then-colleague Dan Thorsland and I were I assigned to develop Droids, a new series of adventures for C-3PO and R2-D2, which also led to my first work as a writer of Star Wars stories. Which of your contributions to the Star Wars galaxy are you most proud of? RW: I’ve been very fortunate to collaborate with so many talented artists on various projects, but one that always comes to mind is the comic story “Thank the Maker” with artist Kilian Plunkett. Aside from books, I’m especially proud of my work with members of the Star Wars costumer clubs—the 501st Legion, Rebel Legion, and Mandalorian Mercs—to promote voluntary blood donations. How has being a graphic designer helped in writing Star Wars books? RW: Because you asked, I should probably elaborate that I majored in graphic design and illustration in college, that I worked as a designer and freelance cartoonist before I became a comic book editor and subsequently a writer. My design background helps me articulate visual concerns in comics and illustrated books, and also influences my approach to prose fiction, everything from how I select words to how I break down the story into chapters. Effective graphic design requires more than slapping some text and images together and hoping your audience will understand your message. It requires thoughtfulness and objectivity, and consideration for communicating emotion as well information. This may sound pretentious or ridiculous, but when I write a story, it’s almost like I’m writing a novelization of a screenplay for a movie that I’m simultaneously writing, shooting, editing, and playing in my mind. But all I really care about is that the readers enjoy the story. RW: I can’t say I have a single favorite character to write about. I think it’s the relationships between various characters that make the individuals more interesting, and the stories more compelling. Consider how Han Solo and Chewbacca get along, and then consider their respective attitudes toward C-3PO, also how C-3PO and R2-D2 fluctuate between bickering and being worried about each other. Now, if you were to ask me which is my favorite character to collect, I confess that my collection of R2-D2 figures used to be extensive, but now it’s just obnoxious. Is there a subject or character that you haven’t written about that you would like to? RW: Well, I haven’t been offered any assignments for The Force Awakens yet. Otherwise, there’s little I haven’t written about in the Star Wars galaxy. Which subjects would you like to see covered by the stand alone movies? RW: I’ll be very disappointed if Big Gizz and Spiker don’t get their own trilogy. Do you have a book (reference, novel, comic, etc) that you most enjoyed doing research for? Which Star Wars ship would you choose to fly and why? RW: The Millennium Falcon because it’s roomy. Just the thought of a long journey in an X-wing makes me feel claustrophobic. Which Star Wars character do you think you’re most like? RW: I’m mostly like the Jawas in that I’m a bit of a scavenger. I like to collect things, and not just R2-D2 toys. It’s a terrible habit. If you could only have one would you choose to have Indy’s whip or Han’s blaster? RW: Tough choice! But I’d choose the whip because it never runs out of ammo. RW: Any color so long as it matches my necktie. Why did you get involved in blood donation and why is it important that we as citizens get involved? RW: I started donating blood in high school. I used to give blood just occasionally, but for years now, I’ve been giving blood every eight weeks. Blood is necessary for people to live, and each donation of a single pint of blood can save up to three lives. Despite ongoing scientific efforts, blood still can’t be synthesized in a laboratory. It certainly doesn’t grow on trees. It can only come from donor. Furthermore, hospitals have a constant need for blood, and blood banks often have shortages, especially during summers and the holiday season, when many regular donors are on vacation. Which is why it’s important to organize blood drives, to educate families about giving blood, and to encourage children to become blood donors when they’re old enough. Several years ago, I found out that my local chapter of the 501st Legion, the 501st New England Garrison, was participating in a blood drive at the Providence Children’s Museum, and I thought that was a wonderful way to promote blood donations, to get entire families involved. Since then, whenever I’ve been invited to an event to give a talk about my work or sign books, I try to set up a blood drive to coincide with the event. Honestly, as much as I enjoy meeting Star Wars fans at libraries, book stores and conventions, I don’t feel entirely useful unless there’s a blood drive going on at the same time. Most blood centers require at least three-months notice to schedule a blood drive, and once a date and location are set up, the blood center handles the rest. Too many people think of blood drives as somber events. Working with Star Wars costumers, I do my best to make blood drives fun for everyone. Last year, I helped organize the World Blood Drive, the first-ever international blood drive for Star Wars fans, and fans in 22 countries participated. This year’s World Blood Drive is set for Saturday, June 13, and we’re hoping even more countries will join in. I want to thank Ryder Windham for taking the time to answer my questions for this blog. It has been one of the coolest things to happen in my Star Wars life. If you would like to get more information or get involved in the World Blood Drive please visit www.worldblooddrive.org and www.facebook.com/worldblooddrive. Donating blood is a way for Star Wars fans to help save lives without getting in a cockpit or igniting our lightsabers. I hope everyone that reads this will consider donating blood in their community. Ryder Windham (and Waldron for that matter) will be at Star Wars Celebration in Anaheim. I’m hoping the Fraternal Order of Ryders will finally have its first official meeting. Previous article Vintage Star Wars Figures: How I Rediscovered My Old Toys Pt 2: Toys or Totems? Thanks so much for reading, Pam and Melinda!